Now that the warmer months are here - I'll be outside grilling my meals as much as I can. As it gets hotter, I like to find as many ways to utilize the grill can - provided I have enough gas in the tank! 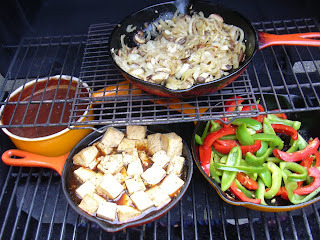 One way I found to maximize my grill space is to use cast iron cookware. I can cook beans, tofu, fish and smaller pieces of vegetables without having to make an offering to the grill gods or losing my food because it's fallen between the grates. Trying to cook fish on a grill is a cooking lesson in futility. Even with a fish grill basket or fish grill spatula, it's still nearly impossible to cook a piece of fish salmon or tilapia without both dousing it in a ton of oil and shredding it to bits. This is where cedar planks and cast iron comes in handy. I can still get a smokey outdoor taste and have pretty food to serve. Outdoor cookery class 101 - I made a bunch of things that will blend together for several meals, utilizing Asian and Mexican Flavors. Asian and Mexican, that's crazy! How is it possible? It's easy - cook things as simply as you can using salt, pepper and garlic and seasoning what will be one meal with Soy, Ginger, Orange, etc., and the other meal with Cumin, Chilies and Lime. Actually, as I think more about it, Asian and Mexican, Latin or Southwest cuisine can have a number of similar flavors. Tomatoes, garlic, cumin, lime, chilies, cilantro. It all depends on how you combine the flavors. I made turkey burgers on the grill and seasoned them with lime zest and lime juice, as well as Mexican Taco Seasoning. I confess, I do make my own blend of Mexican seasoning - as I don't like the salt, sugar and MSG that you get in the supermarket version. A simple Mexican all-purpose seasoning can be mixed together using: Ground Cumin, Ground Ancho or Chipotle Chili Powder, Oregano, Smoked or Sweet Paprika, Onion and Garlic Powders, Ground Black Pepper, Thyme, Dried Cilantro and Dried Lime Zest. Season your food with salt separately. So that I could make several meals at once, I cooked a lot of vegetables on the grill - but kept them all separate. Each vegetable was seasoned only with olive oil, salt, pepper and garlic. I made the onions and mushrooms separate since Liz doesn't like them, but I'll eat them with my Mexican Turkey Burger as well as with my Tofu Scramble. I also cooked squash and zucini, and red and green bell peppers. I marinated tofu in a soy orange five-spice marinade, and then cooked it in the marinade in a skillet on the grill. It absorbed the liquid, firmed up. I did not have to turn on the oven and bake it for an hour or mess with frying or wok searing it - adding oil and possibly having it fall to pieces the more I touched it. I made what I'm calling Mexican Cowboy Baked Beans - black beans with my Mexican Taco Spice, fresh minced garlic, tomato sauce, a few tablespoons of ketchup and some worchestchire sauce. I cooked them on the grill in a small pot and let the sauce reduce and thicken. They were tangy, smokey and a bit sweet, but not as sweet as regular baked beans. To tie both of my meals together - I made a pot of multi-grain rice. A healthier and heartier choice than using white or brown rice, though either kind of rice would be fine if that's all you have on hand. 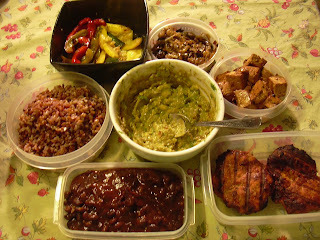 We had our turkey burgers with the rice and Mexican Cowboy Baked Beans, along with the grilled vegetables. Topped off our burgers with some homemade guacamole. For my lunch on Monday, I'll have the multi grain rice with the tofu, the grilled vegetables and a few handfuls of fresh spinach. When I reheat my lunch, the spinach will steam and cook, and the whole thing will come together, flavored by the sauce the in which tofu cooked. This was a fast way to cook a lot of food, and to have more options. I hate having left-overs beyond two days. By preparing more vegetables without a lot of extraneous seasonings, you can use them in a variety of meals - Italian with pasta and tomatoes; Asian with a soy sauce dressing; Latin with salsa and guacamole. Learn to taste your food without having a lot of extraneous and sodium packed sauces. I am rediscovering that the way you cook your food can actually enhance it's taste. So many times we forget how a roasted pepper should taste because it's dunked in a brine and then slathered with olive oil. As my mother always says, "LESS IS MORE!"